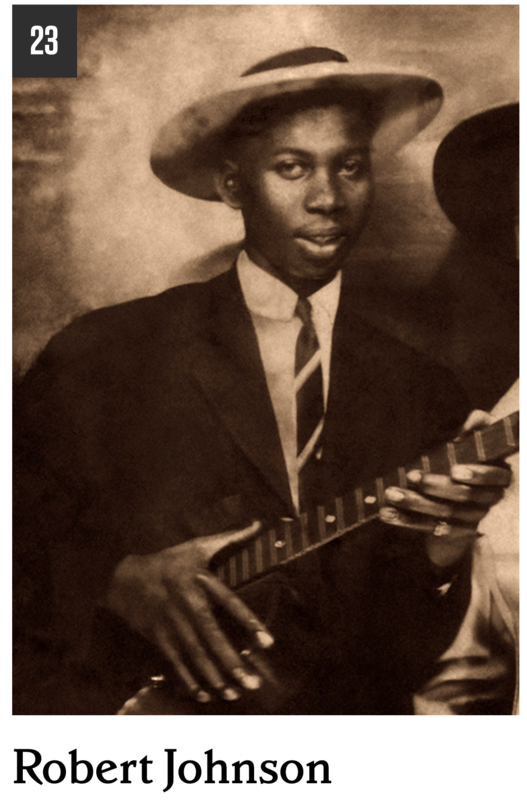 At number 23 in Rolling Stone Magazine’s list of the 100 greatest songwriters of all time is Robert Johnson. Although I was not previously familiar with Johnson’s name, as I mentioned before I was already familiar with his song Sweet Home Chicago, and that is the song that I have included here (for some reason, I did not include it in my previous blog about him). Johnson recorded in the 1930s, and died in 1938 at only 27 years of age. The cause of his death is a matter of much speculation; the most popular theory is that he was poisoned by a jealous husband for having an affair with the man’s wife. Whatever the cause of his death, the world was certainly robbed of a real pioneer of the developing blues music. Honey don’t you wanna go? Here is a video of Robert Johnson singing possibly his most famous song. Enjoy! Which is your favourite Robert Johnson song? 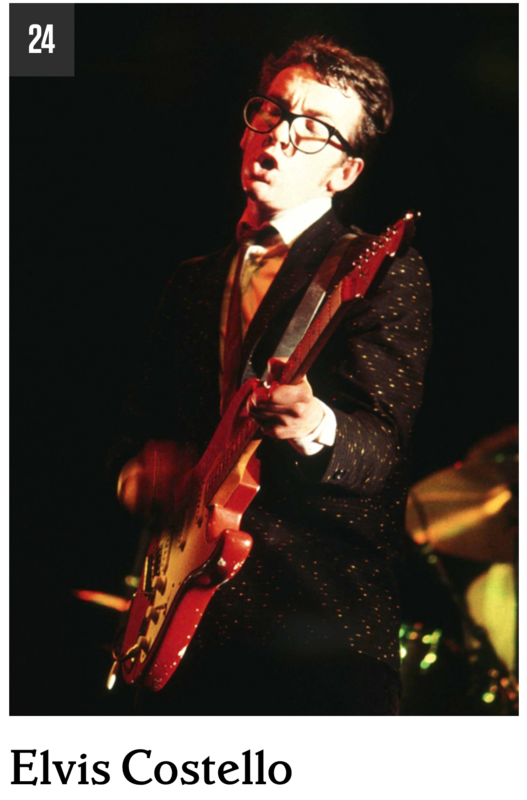 At number 24 in Rolling Stone Magazine’s list of the 100 greatest songwriters of all time is English singer-songwriter Elvis Costello. Elvis Costello first came to my attention in the late 1970s when he had some punk hits with his band The Attractions, and in fact I have already blogged about one of their songs, “Oliver’s Army” here. By 1986 Costello had split from his band, and embarked on a solo career. This solo career has seen him radically change his style from his early punk days, in fact his solo career has ranged from country and western to old style ballads A good example of this diversity is the song I have decided to include here, “Veronica”, a song he co-wrote with Paul McCartney, and which was released in 1989. At number 24 in Rolling Stone Magazine’s list of the 100 greatest songwriters of all time is Elvis Costello. “Veronica” only got to number 31 in the Disunited Kingdom singles charts, but in the US it got to number 19, possibly because of McCartney’s involvement. Since then, Costello has also gone on to work with such songwriters at Burt Bacharach in the late 1990s. He has also composed music for an opera, and is surely one of the most diverse songwriters in this list. Here is a video of the Costello-McCartney song “Veronica”. Which is your favourite Elvis Costello song? Later today, Wales will take on Australia in their final group match in the rugby World Cup. Both countries have qualified from the “group of death”, with England (the hosts) failing to go through having lost to both Wales (28-25) and Australia (33-13) the last two Saturdays. Although both Wales and Australia have qualified for the quarter finals, the winner of Group A will have a much easier quarterfinal. The winner of today’s Wales v Australia match, and hence of Group A, will play the runner-up of Group B, which could be either Scotland or Japan. The loser today will be runner-up of Group A, and they will face South Africa (who have topped Group B) in the quarter final, a much more difficult proposition. 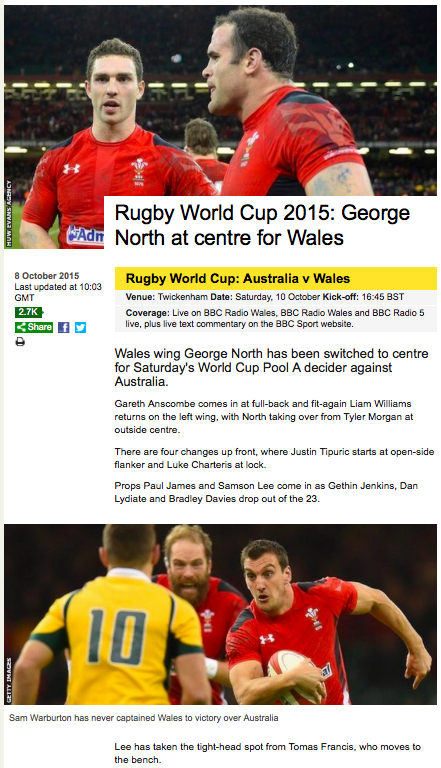 So, I would imagine both Wales and Australia will be going all-out to try to win this afternoon’s match. Wales will take on Australia this afternoon at Twickenham, a neutral venue. The match starts at 16:45 BST. Warren Gatland has gone for a very bold team in his attempt to top Group A. Normally Gatland’s selection policy is pretty conservative – he likes to stick with the players he knows well and whom he feels can perform at the highest level in big-game situations. But, on Thursday he surprised everyone with a few unexpected selections. He has brought George North into the centre, with Wales so depleted in that area due to injuries, and moved Liam Williams from full-back to wing. In at full-back is Gareth Anscombe, the New Zealander who has pledged his senior future to Wales by using his Welsh-heritage, after representing New Zealand at junior level. For the last season he has been playing his rugby for the Cardiff Blues; but I think I am right in saying that this has mainly been at outside half. However, I do believe he has some Super 15 experience playing at full-back, so hopefully he will slot in there quite easily. 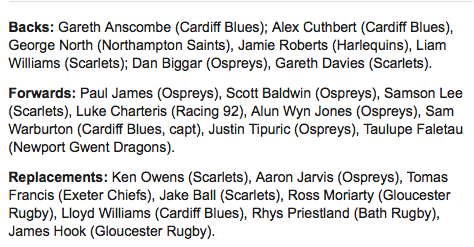 Blind-side flanker Dan Lydiate is dropped, replaced by open-side flanker Justin Tipuric. According to Gatland, this is because Lydiate has a facial injury from the match against Fiji; but I cannot help feeling that he wanted to play two open-side flankers in Tipuric and Warburton to counter the Wallabies’ marauding pair of Hooper and Pocock. The breakdown will be a major area of contest, and it could be argued that it is where Wales won the game against England and where England lost the game against Australia. The final surprise in the selection is that veteran loose-head prop Gethin Jenkins is dropped in favour of Paul Jones. Again, according to Gatland this is because Jenkins is feeling the strain of three matches in a short space of time, and Gatland wants to give him a break before the quarter finals. Whether the change is also to try to shore-up the creaking Welsh scrum is a distinct possibility; whilst Gethin Jenkins is almost unsurpassed as an loose-head prop in open play, his scrummaging is not as strong as Paul Jones’ and this is an area where Wales have looked distinctly shaky in their matches against both England and Fiji. Gatland has gone for a bold selection in his attempt to beat Australia and top Group A.
I have to say that Australia were very impressive against England; and Wales have not beaten them since 2008. In each of the last 5 or 6 times that we have played them we have lost by just a few points each time; and on more than one occasion have been leading going into the last few minutes. Hopefully these near misses will galvanise the Welsh team to a win this time, with the prize being a much easier path into the World Cup semifinals. 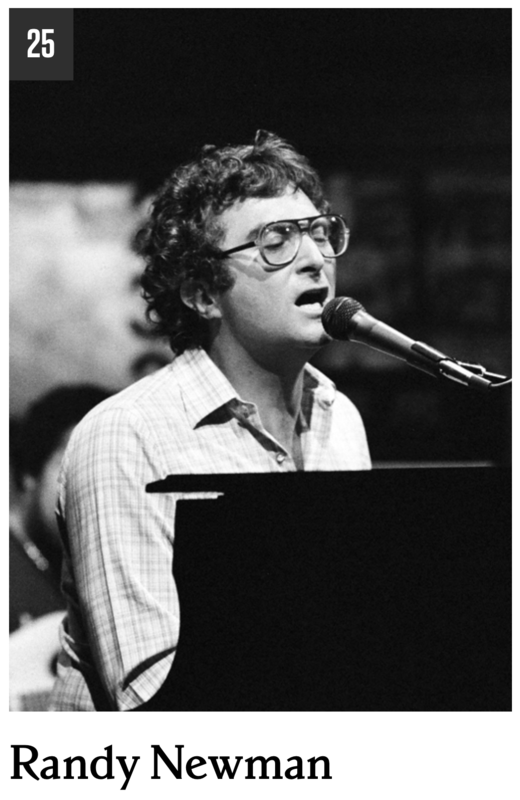 At number 25 in Rolling Stone Magazine’s list of the 100 greatest songwriters is American singer-songwriter Randy Newman. I must admit, I barely know any Randy Newman songs. I am aware of him, and know that he writes satirical songs, but I doubt I could name one. I have had a look at the list of singles released by him on his Wikipedia discography, and I don’t recognise any of them. I do recognise a couple of the songs written by him but performed by others, so have decided to include one of those here. I notice in his list of released singles that only one has charted in the Disunited Kingdom, so maybe he is a much bigger artist in the US than he is in the DUK, but when I lived there I certainly was no more aware of him than I was before or since. Oh dear, I wonder what I have been missing? At number 25 in Rolling Stone Magazine’s list of the 100 greatest songwriters of all time is Randy Newman. The song of his that I have decided to include here, because it is (a) a fantastic song and (b) the one written by him which immediately jumped out at me is “Mama Told Me (Not To Come)”, which was a hit for Tom Jones and The Stereophonics (both from Wales). This was released in 2000 and got to number 4 in the DUK singles charts, but I must admit that I had no idea that Randy Newman had written it! I can see that it was also performed back in 1970 by a band called Three Dog Night. Here is the video of Tome Jones and The Stereophonics performing this great song. Enjoy! Which is your favourite Randy Newman song? Does he deserve to be at number 25 in this list? 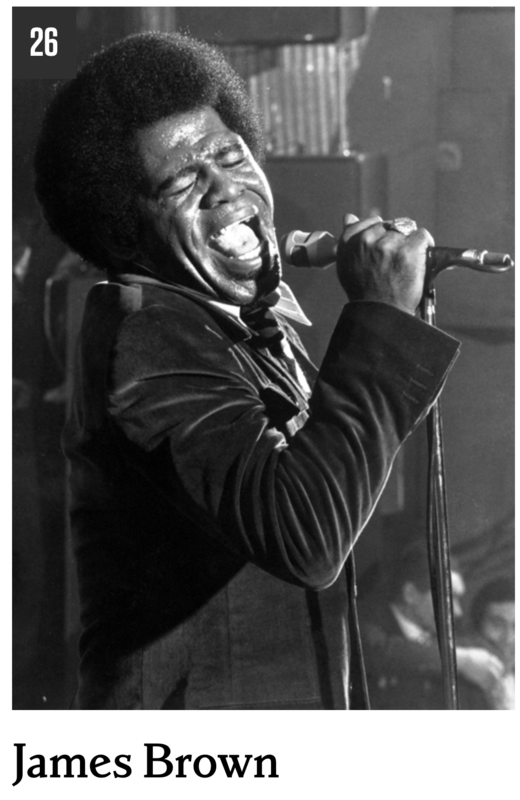 At number 26 in Rolling Stone Magazine’s 100 greatest songwriters is James Brown. Brown was born into poverty in South Carolina, when he was 4 or 5 his family moved to Georgia. He grew up signing gospel, which is still a common route for many black artists. Brown first came to prominence in the late 1950s, but it was in the 1960s that his career hit its peak. This is when he had most of his biggest hits, including the song which I am including here, “I Got You (I Feel Good)”. His nickname was The Godfather of Soul, and he developed a reputation for his energetic live performances. His album Live at the Apollo is at number 25 in Rolling Stone Magazine’s list of the 500 greatest albums, I blogged about that album here. At number 26 in Rolling Stone Magazine’s list of the 100 greatest songwriters of all time is James Brown. In the early 1970s Brown developed his sound further, and is often credited with starting the musical genre known as funk. In the mid-1970s his career went into decline, including a stint in prison in the late 1980s when he was convicted on drug and weapon possession charges. He was sentencted to six years, he was released on parole after serving two years of his sentence. He set about rebuilding his career and his reputation. He died in 2006 from heart failure. He is considered one of the most influential songwriters of the 1950s and 1960s. Which is your favourite James Brown song?